Back in September 2016, when its stock was imploding over capitalization and solvency concerns, the market was transfixed with the daily drop in Deutsche Bank stock price, which tumbled, eventually sliding below €10, and only implicit promises that Germany would bail it out, prompted a slow, if painful reversal. And yet, at no point in that period did the stock close at a level below where it closed today: a new all time low, crashing 7.2% to €9.16 following reports that the bank was on the Fed's "Secret" probation list. 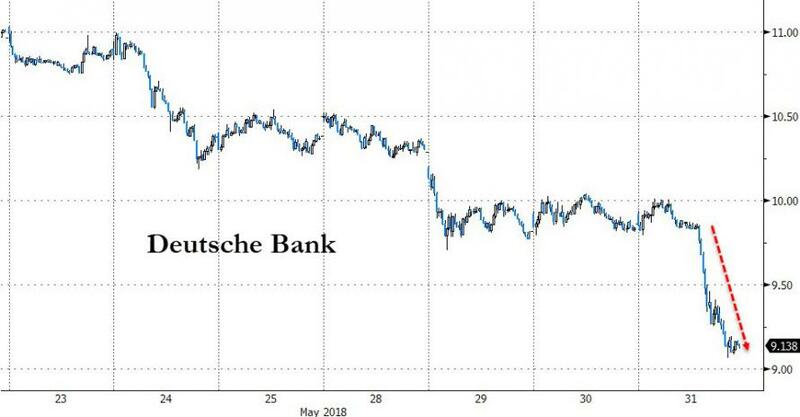 However, the one saving grace is that unlike in 2016, or 2008, Deutsche Bank did not feel it needed to make an official statement addressing the recent stock crash. Because, as traders know all too well, the one thing that assures a banking crisis is imminent is for a bank to promise, plead and vow there is no reason to be worried as no crisis is imminent. But not anymore, because shortly after 8pm local Frankfurt time, Deutsche Bank's new CEO - experiencing a bizarre case of dreadful deja vu as his stock crashed to new all time lows - decided to validate everyone's worst fears by issuing a report addressing "media reports about the regulatory ratings of our US entities" and which after prefacing that "we do not comment on any supervisory ratings as our communication with regulators is confidential", goes on to comment extensively on the bank's supervisory ratings. Deutsche Bank has been engaged in remediation work to strengthen our internal control environment and infrastructure and to address concerns that have been identified both internally and by our regulators. There are no concerns with regard to the financial stability of Deutsche Bank AG. We are highly focused on addressing the issues with our U.S. operations and will continue working diligently to solve them. We don't doubt at all that Deutsche Bank is committed to its US business. The question is whether the US, and the Federal Reserve, are committed to having Deutsche Bank on US soil. After all, with legacy banking revenues and margins declining year after year, and with the banking sector clearly oversupplied in terms of trading floors and traditional iBanking services, the one thing that can help the rest of America's banks is if "something" happened to Deutsche. Think ritual sacrifice; think Lehman (only less dire, for now). Which is why don't be surprised if tomorrow the statement's impact on DB's stock is precisely the opposite of what Christian Sewing had intended. Media on Thursday published articles about the regulatory ratings of Deutsche Bank’s US entities. “As a matter of policy, we do not comment on specific regulatory feedback. The ultimate parent of the Deutsche Bank Group, Deutsche Bank AG, is very well capitalized and has significant liquidity reserves. The entities named in the article are three specific U.S. subsidiaries – DB USA Corp, Deutsche Bank Trust Corporation, and Deutsche Bank Trust Company Americas, our principal U.S. banking subsidiary, which has a very robust balance sheet as disclosed in our annual and quarterly regulatory filings. We have previously indicated that our regulators have identified various areas for improvement relating to our control environment and infrastructure. We are highly focused on addressing identified weaknesses in our U.S. operations." Have the US regulatory authorities changed the bank’s rating and does this mean the bank is in troubled condition? We do not comment on any supervisory ratings as our communication with regulators is confidential. It is important to note that Deutsche Bank AG is very well capitalized and has significant liquidity reserves. As we clearly noted in our annual report in March 2017, Deutsche Bank has been engaged in remediation work to strengthen our internal control environment and infrastructure and to address concerns that have been identified both internally and by our regulators. There are no concerns with regard to the financial stability of Deutsche Bank AG. What are the remediation deficiencies the regulators identified and how quickly will these issues be resolved? While we are not allowed to comment on our discussions with regulatory authorities we note that there are resolutions of four enforcement actions which are published on the website of the Federal Reserve (www.federalreserve.gov). These resolutions relate to our internal control environment and infrastructure. We are highly focused on addressing the issues with our U.S. operations and will continue working diligently to solve them. None of these issues affect our ability to serve clients. What is the financial health of the US subsidiaries? All of our U.S. subsidiaries have very robust balance sheet as disclosed in our quarterly regulatory filings. The assets of the three entities concerned are below ten percent of the overall balance sheet of Deutsche Bank Group. DBTCA’s latest regulatory filing as of March 31, 2018, included $9.1 billion of Common Equity Tier 1 Capital, a Common Equity Tier 1 Capital ratio of 98.15% and a Tier 1 Leverage Ratio of 21.68%. DBTCA also had a strong liquidity position with 75% of its $42.1 billion of total assets invested in cash on deposit with the Federal Reserve Bank or financing activities backed by US Treasury securities collateral. DB USA Corporation’s latest regulatory filing as of March 31, 2018, included $7.1 billion of Common Equity Tier 1 Capital, a Common Equity Tier 1 Capital ratio of 15.88% and a Tier 1 Leverage Ratio of 7.3%. The capital base includes the consolidated subsidiaries, and thus reflects a broader and different risk profile that that of DBTCA, which holds primarily cash, loans and liquid securities. DBSI’s most recent annual report as of December 31, 2017, included $10.5 billion of US GAAP Equity, $12.2 billion of Regulatory Net Capital, and $11.9 billion in excess of the required minimum net capital. Excess Net Capital (regulatory capital in excess of regulatory minimum capital requirements pursuant to SEC Rule 15c3-1 – Net Capital Rules) is well above the minimum capital requirements and well in excess of what’s required considering DBSI risk profile and current assets. What regulators cover each of the entities? The primary regulator of most of our U.S. banking entities is the Federal Reserve. The FDIC is the primary regulator of our Delaware bank and insures DBTCA’s deposits to the extent provided by law. Our New York branch is supervised by the Federal Reserve and the New York State Department of Financial Services. DBSI is regulated by the Securities and Exchange Commission. Do the reported control weaknesses affect clients? No, we are fully able to service our clients’ needs and we are doing business as usual. Nevertheless, we are determined to resolve these matters as expeditiously as possible. Are we committed to our U.S. business? The answer clearly is “yes.” As Christian Sewing said at a public reception on Wednesday in Berlin, the U.S. is the most important market for Deutsche Bank outside Germany. Our recent strategic announcement is not a result of the regulatory actions but part of a program to increase the profitability of the firm. We are fully committed to our Corporate & Investment Bank, Wealth Management and Asset Management businesses in the U.S.